Designing products with celinefanonline sleeves is based on a single scheme basis shoulder products with vtachnoy sleeves. Zelenolistnye sleeves lend softness, plasticity, increase the volume in the region of the armholes, which creates ease of movement. The shape of the sleeve depends on the direction of the upper edge and the depth of the armhole. The smaller the slope of the upper edge of the sleeve provides the product a milder form in the region of the openings, a greater tilt creates a more distinct shape in the shoulder girdle and arm openings. To increase the softness in the top part of the dress solutions chest and shoulder tucks are reduced or eliminated altogether. Design clinofibrate sleeves without gussets, the most simple, the upper section is a continuation of the shoulder seam and the lower continuation of the side seam. 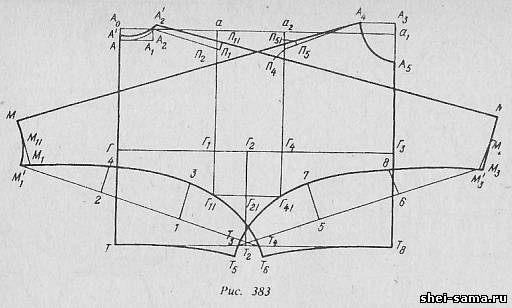 The drawing of the dress (Fig. 383) builds a right angle with the vertex at point A0. From point A down the vertical axis is the segment that defines the level of the depth of the armholes, equal to the distance measurement from the highest point of the shoulder seam at the base of the neck to the level of the rear corners of the armpits (ITRS) with the addition of free customized fit in the region of the openings, and put a dot G.
Then determined the level of the waist line, which is equal to the distance from the waist line in the back to the highest point of the shoulder seam at the base of the neck (DTS) increase the length of your waist plus the size of the overlap (if it exists) and put the point T.
From the points G and T are to the right of the horizontal line. From the point A0 to the right horizontally is the cut equal to the measurement poluobhvat chest of the third (Sh) plus the increase in free fit at the chest line, and a dot A1. А0а1 = SG + PG = 48 + 7 = 55 cm. From the point A0 to the right horizontally is the period equal to half the width of the back plus increase the width of the back, and put a dot. А0а = SS + N = 18,3 + 2,2 = 20.5 cm. Cut Aa2 determines the width of the openings. When designing products a tight fit on the chest to avoid saujanya the width of the openings compare the result of calculation or of construction value with a minimum width of openings (table. 2), and if it is less, after verification of the calculations is increased to this value. The required extension portion of the openings should be carried out or due to the redistribution of allowances on the chest (GHG) on sites, if you increase the width of the back and width of chest can be reduced to a minimum, or by increasing the gain on the chest. From the points a, A2 and A1 is lowered vertically. The intersection of the verticals coming from points a and A2, with the bust line represent the points G1 and G4, and the intersection of the vertical that goes from point A1, with the lines of the bust and waist refer to the points T3, T8. To build the neck back to the right of the point A0 is delayed a period equal to the poluobhvat neck divided by 3, plus increase the width of the neck. For shapes with fatty deposits in the region of the seventh cervical vertebra or with developed muscles in the shoulder girdle, the width of the neck backless increase by 0.5-1.0 cm, for figures with increased curvature of the back in dresses with no middle seam of the back are 1-2. 5 cm, i.e. on the value of the solution of the projected Darts in the neckline of the back. From the point A2 down perpendicular postponed the height (depth) of the neck. А2А1 = А0А = А0А2/3 = is 7.2/3 = 2.4 cm where А0А2 this without taking into account the solution of the tuck seam of backrest and allowance for body fat. The curved neckline of the back is made of a smooth curve through points A and A2. The position of the end of the shoulder seam of the back L1 is determined by the intersection of two arcs: the arc from the point A2 to a radius equal to the dimension of the width of the shoulder (SHP) plus landing or solution tuck (if available), and an arc from point T with a radius equal to the height measurement shoulder slash (VPC) plus increase the height of the shoulder oblique, plus the amount of overlap (if it exists) and put a dot P1. The increase to the height measurement shoulder slash consists of increase in length to the waist line plus the increase in the thickness of the shoulder pads. Usually in dresses with a tight fit in the shoulders provides the solution of the shoulder tuck in the cut 2-2. 5 cm for soft tissue structures and 1.5-2 cm for dry fabrics. For pereghibati figures tuck is reduced and slouching is increased by 0.5 cm Points A2 and A1 are connected. From the point P1 to the vertical AG1 is restored to the perpendicular and is denoted by point P2. To build the neck of the front is determined by the position of the apex of the neck. From the point T8 in the line of mid front up is delayed a period equal to the distance from the highest point of the shoulder seam at the base of the neck (DTP) to the waist line in the front plus a raise, plus the overlap, and put a dot A3. Т8А3 = DTP + PR + overlap = 44,4 + 0,6 + 2 = 45 cm. From the point A3 to the left draw a horizontal line where lay the width of the neck front. Mouth width equal to the width of the front of the neck backless without mortar tuck and allowance for fat А3А4 = AA1 = 7,2 cm Depth neckline of the front is equal to its width plus 1 cm А3А5 = А3А4 + 1 = 7,2 + 1 = 8,2, see the line of the neck issue as follows: from the points A4, A5 radius equal А3А5 spend two arcs in the direction of point A3 and the point of intersection of the same radius, hold the line of the neck from point A4 to point A5. Through the points A1, A12 conduct a new the neckline of the back, through the points A12 and A11 - line shoulder cut of the back and through the points A4, П51 - line shoulder cut front. The side seam in the middle of the armhole at the point G2. Then from the points G1 and G4 down the verticals postpone further deepening the openings, the segments denoted by the points G1, G11 G4, Г41. The lowest level of depth of the openings is approximately in the middle between the lines the bust and waist. Г1Г11 = Г4Г41 = 10 cm cut Г11Г41 Intersection with the vertical drawn from the point G2 is indicated by the point Г21. The upper sections of the front and elbow parts of the sleeves are a continuation of the shoulder sections of the front (А4П51) and backrest (А12П11). On these lines of dots П51 P11 is delayed and sleeve length. For final design bottom line find the position of the middle sleeve. Connecting point M, M11 and M11 receive line of the bottom front of the sleeve, and the connecting point M2, M21 and M13, the bottom line is the elbow of the sleeve. Then hold the line of the bottom of the backrest through the points T, T5 and line the bottom of the front through the points T8, T6 with a smooth curve.